Mayan Ruins of Chichen Itza which is the best and most popular cultural tourist attraction in Mexico, and due to its importance was inscribed in UNESCO World Heritage list. The main pyramid of Chichen Itza of the ancient Mayan city, Kukulcan, was declared one of the New Seven Wonders of the World. Flying to Chichen Itza from Cozumel allows you to visit early in the morning, out of the hot sun and before the masses of tourists that arrive on day trip tours by bus. The ancient city of Chichen Itza is the most visited archaeological site in Mexico, including the iconic Kukulcan pyramid, the Observatory, Mayan Ball court and famous Temple of Warriors attracts millions of visitors each year. With Fly Cozumel’s Mayan Ruins of Chichen Itza By Airplane From Cozumel you’ll also get to visit the Sacred Cenote, a freshwater cavern that was very important in Mayan rituals and sacrifices. 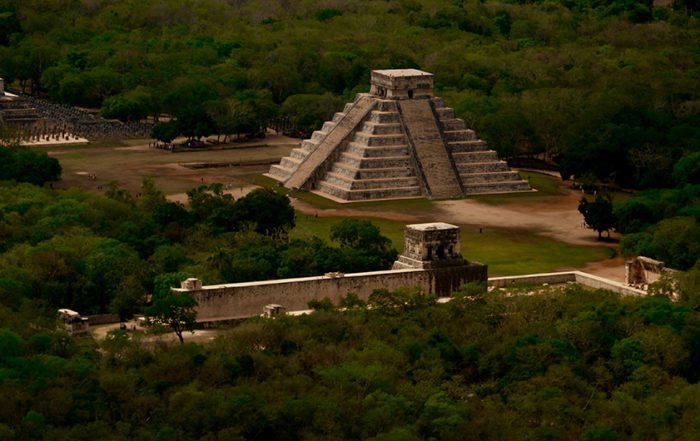 What is included in the Mayan Ruins of Chichen Itza By Airplane From Cozumel tour? A Fly Cozumel representative will welcome you at the Cozumel Airport, where you will meet your pilot, who will fly you and your party aboard our Cessna Airplane in approximately 45 minutes to Chichen Itza so you will arrive before the crowds. The air flight is beautiful, partly over the Caribbean waters, partly over the Mayan Riviera’s semi-dry tropical jungle. Upon arrival at the ruins, Fly Cozumel’s private guide will be waiting for you at the archaeological site to guide you through this impressive MUST SEE ancient Mayan city. After leisurely touring the ruins, you have the opportunity to plunge into a beautiful fresh water natural cavern, or cenote, afterwards a traditional Mexican lunch will be served.